Our directory is a great place to list your business and contact details, so anyone who's looking for your service can get in touch. The directory is accessible to everyone on the site, but only Full Members can make new listings. To post in the directory, click the orange Submit Listing tab in the top right hand corner of the homepage. Fill in your details, assign it to an appropriate category (don't worry, you'll be able to add more categories later) and click the orange Add Listing tab at the bottom. Please don't worry if your listing doesn't appear immediately – listings often need to go through our moderation queue before they're made live, but we'll aim to have it cleared within 24 hours. 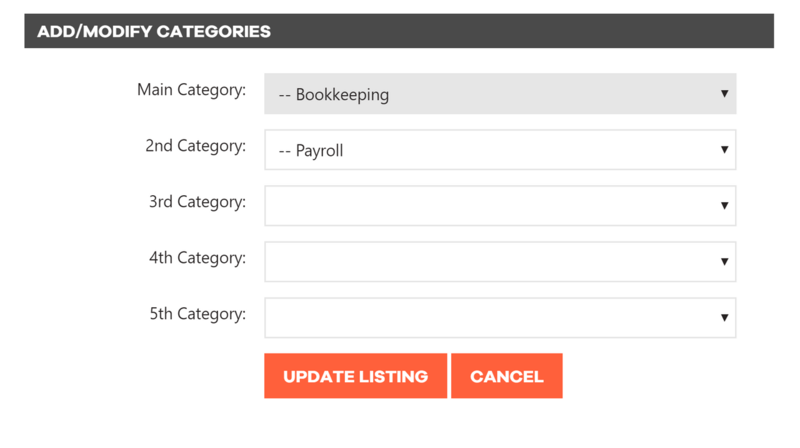 Once your listing is live, you can assign it to a number of different categories by clicking the orange Add/Modify Categories tab at the bottom of the page. Please do this instead of making separate listings - it saves our moderators (and you!) a lot of time, and makes it much easier for you to edit in future. You should then be able to assign your listing to other categories that are relevant to your business. • The business you post in our directory must be your business. We don't allow the posting of client or affiliate businesses. Any client or affiliate businesses will be removed, and your Full Membership may be revoked. • Please don't make multiple listings within the same category. It isn't fair to other users, and any posts like this will be treated as spam.